Beacon Hill lawmakers rejected the bulk of a Senate crackdown on taxpayer-funded benefits for illegal aliens, part of a compromise budget spending more than $27 billion they hope to pass today and send to Gov. Deval Patrick. House and Senate dealmakers nixed a 24-hour hotline to report illegal aliens and refused to force the attorney general to agree in writing to enforce federal immigration law. And they would not put into law language barring state schools from offering in-state tuition rates to illegal aliens. State lawmakers last night completed a $27.6 billion budget plan for next fiscal year that would cut local aid for cities and towns, require all government offices to remain open on Bunker Hill Day and Evacuation Day, and impose a softer crackdown on illegal immigrants than the measure approved by senators last month. A group of six House and Senate negotiators had been hammering out the final budget, which includes a broad range of policy and spending plans, behind closed doors since June 7, trying to reconcile differences between plans passed earlier this year by the two legislative bodies. Both the House and Senate are expected to vote today on the budget. The fiscal year begins July 1. Lawmakers decided not to impose some of the stricter immigration measures that passed the Senate with great fanfare last month, including the establishment of a 24-hour hot line to report companies that hire illegal immigrants and a requirement that the attorney general begin discussions with federal officials to offer help in enforcing immigration laws. Instead, lawmakers said, they decided to make official current practices that bar illegal immigrants from receiving state services. A group of opponents to the Senate measure, called the Student Immigration Movement, has been holding around-the-clock vigils outside the State House for 17 days in protest. But polls have generally shown that much of the public favors stricter immigration enforcement. The relatively swift conference was jarred weeks ago by Washington's refusal to authorize a $24 billion national fund from which both Gov. Deval Patrick and the House expect to derive $608 million, while the Senate is banking on $687 billion. Mixed signals from Congress have led to doubts over when or if the money will arrive. The North Shore Chamber of Commerce has joined several other business groups, including its Cape Ann counterpart and Associated Industries of Massachusetts, in urging the Legislature to give municipal officials "plan design" authority over the health plans offered their employees. "Exploding health care and pension costs are forcing cities and towns to curtail services," the coalition rightly notes, adding that unless these issues are addressed, "cuts and layoffs will intensify over the next several years." If lawmakers squander this opportunity, they do not deserve re-election. Unions worry about teachers who are preparing to retire, and they fear that concessions will reduce the amount those people can collect in their pensions. Voters in November will get the chance to slash the state sales tax from 6.25 percent to 3 percent, according to advocates who say they submitted more than enough petition signatures yesterday to force the item onto the ballot. Widmer pointed out that the state continues to collect less in sales tax than do most of the 45 states that have a sales tax. Only three other states that collect sales taxes have lower tax burdens, because Massachusetts has a narrow sales tax base that excludes groceries, services, and clothing up to $175, he said. The state Legislature's House and Senate budget negotiators, "dealmakers" as the Boston Herald described them, last night agreed to a $27.6 billion budget plan that apparently will be voted on today by the full House and Senate. It has removed much if not most of the Senate language which would have eliminated taxpayer support of illegal aliens, instead compromising on the language; "putting those practices into law will ensure they remain enforced" -- whatever that means. "Remain enforced"? I wonder if it'll affect President Obama's aunt, illegal alien Zeituni Onyango, long a resident of taxpayer-funded Boston public housing? When it comes to taxpayer-funded in-state tuition for illegal aliens,the compromise language "would not put that practice into law." I wonder why not? The proposed budget again does not address "plan design," finally providing municipal officials with some input into the health insurance plans granted to our local "public servants." As the Boston Herald editorial states: "If lawmakers squander this opportunity, they do not deserve re-election." None of this slows down public employee union demands for more by even a beat -- especially the teachers unions. In Methuen, its president is demanding higher property taxes and user fees to fund her union members' pay raises, despite the recession and everyone else's financial hardship. We all know why the public employee unions need more money. They need it to fight off citizens' attempts to cut taxes. The next threat to their elitist entitlements was announced yesterday. The petition drive campaign to roll back the sales tax to 3% announced it had more than enough signatures from its second round of collection to put the question on November's ballot. Already the usual tax, borrow, and spend cabal is swarming to oppose it, led as usual by the so-called Massachusetts Taxpayers Foundation and its president, Michael Widmer. Widmer is the fool who's been calling for "plan design" and as usual has ended up with not a whit to show for his dog-and-pony show. Widmer will never learn that the only way to achieve any meaningful reform is to turn off the money faucet. As a creature of Fat-Cat Big Business, government reform is not high on his agenda or that of the organization which employs him, and never has been. If it doesn't benefit his clients, then by all means tax it more to keep the gravy train running. You might recall that Carla Howell's income tax repeal lost by 70-30 percent on the 2008 ballot -- primarily due to the $7 million opponents raised and spent to defeat it. Do you recall that five million dollars of that total came from the teachers unions alone, both in and out of state? Contributions to raise that kind of money aren't voluntary, like yours or mine. That kind of money comes directly from members' mandatory dues. Higher salaries and more members mean greater amounts to defeat taxpayers -- their alleged employers. So they want to raise our property taxes even more, so they can use their pay increases from us to help grind us even further into the ground. 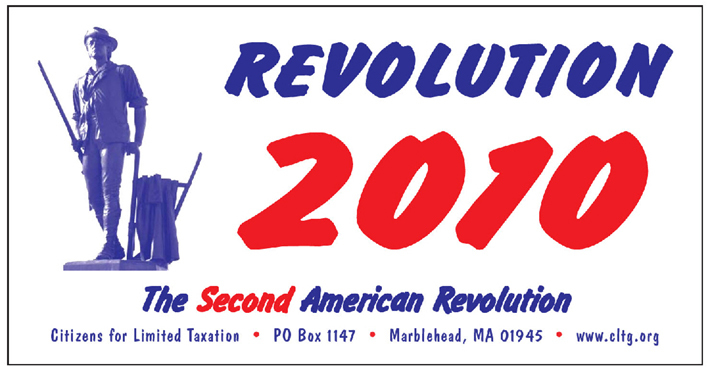 Revolution 2010 -- only 130 days away and counting down . . . Lawmakers also repealed the lifetime appointment for the state probation commissioner but decided to study who should run the scandal-plagued department. Hack holidays - Bunker Hill Day and Evacuation Day - would remain, but all government offices would stay open and fully staffed, lawmakers said - except where collective bargaining agreements with public employee unions say otherwise. Budget negotiators filed plans to spend $27.9 billion or $27.6 billion, depending on whether the feds send the state some $687 million in federal Medicaid dough that’s up in the air. Gov. Deval Patrick has 10 days to sign the budget, reduce items or veto what he doesn’t like. But the lawmakers were thrown off course in recent days as they were forced to plug an additional $687 million gap to account for federal stimulus money that had been expected to keep some state programs afloat, but is now far from certain to arrive. “We are, I would suggest, under no illusion that this . . . money is coming,’’ said Representative Charles A. Murphy, a Burlington Democrat who leads the House Ways and Means Committee. The budget features cuts in social services, the court system, higher education, and nearly every other aspect of state government. That includes complete elimination of a $56 million program that gives health care to low-income immigrants who are considered legal, but not permanent, residents, plus another $68 million from other health programs for low-income residents covered under MassHealth, the state Medicaid program. Some programs could be restored, or partially restored, if the additional federal stimulus money is approved in Congress. To avoid deeper cuts, lawmakers also called for withdrawing $100 million from the state’s rainy day fund, a move they had earlier pledged not to make because the fund has been tapped with regularity in recent years. Senator Steven C. Panagiotakos, who chairs the Senate Ways and Means Committee, said many residents are unaware that current state practices already keep immigrants from receiving state services and that putting those practices into law will ensure they remain enforced, while also bringing attention to them. Though illegal immigrants are currently barred from receiving in-state college tuition, the compromise language would not put that practice into law. Governor Deval Patrick, who is running for reelection against two opponents who favor stricter immigration enforcement, must sign off on the budget before any of the immigration measures agreed to last night become law. He has said he favors putting current practices into law, but would not like to go further than that. The budget compromise submitted last night also includes a measure that would give the state’s top administrative judge some power over the Probation Department’s budget, an issue that emerged last month after the Globe Spotlight Team chronicled widespread patronage hiring and lax spending controls at the agency. The measure would eliminate the lifetime appointment for any future, but not the current, commissioner of the department and initiate a study on who should ultimately oversee it. The budget compromise left out language passed in the Senate that would have given cities and towns more power to curb the fast-rising costs of employee health plans, by giving them the authority to amend employee health plans without union approval. Municipal leaders have been demanding the changes, saying health costs are busting their budgets, but unions have fought the changes; many lawmakers have also been resistant, saying they do not want to weaken collective bargaining. The provision requiring government offices to remain open on Evacuation Day and Bunker Hill Day would not affect collective bargaining agreements; union members with those days off under their contracts would still get them. The City of Boston also stands to lose at least $2.4 million more in library funding if, as planned, it closes four branches during the next budget year. The Legislature’s compromise plan includes language taking that money away to prevent closings, even though the city says it is forced to close the branches largely because state funding has been declining in recent years. Andrew Ryan of the Globe staff contributed to this report. Senate and House negotiators reached a budget compromise Wednesday that patches a $687 million gap created by absent federal aid with deeper cuts than their original drafts and a raid on savings, curtails the Senate's crackdown on illegal immigration, and shelves a union-opposed proposal to grant local officials authority over public employees' health care plans. Relying on $100 million in state reserves to help offset the federal Medicaid funds that have hit roadblocks in Washington, a House-Senate conference committee slashed spending for legal immigrants' health care. The budget factors the loss in federal aid into its spending plan by making "targeted cuts," House budget chair Charles Murphy said, allowing for a long-promised 4 percent cut to local aid and level-funding other accounts providing dollars to cities and towns, including a special education circuit-breaker account and regional school transportation program. The budget deal scaled back the Senate immigration plan by removing a 24-hour hotline for residents to report illegal immigrant hiring, a provision authorizing the attorney general to enter into a memorandum of understanding with the Department of Justice to enforce federal immigration laws, and an explicit prohibition against in-state public higher education tuition rates for illegal immigrants. The compromise puts in statute existing practice barring state services and benefits for illegal immigrants. "Basically, we codified existing regulations and practices and policies of the Commonwealth," said Senate budget chief Steven Panagiotakos. "Anything that was extraneous to that, we did not codify." Following last year's small-bore pension system reform, the budget includes more sweeping provisions, including anti-spiking language and a cap on individual pensions at $156,000 annually, a figure that will rise in accordance with a federal formula. The compromise creates a "budget relief fund" in case the $687 million does arrive. Negotiators pulled $160 million from the bottom line by picking the lower line item allocations between the two budgets. They relied on updated additional revenue collections that have arrived since the chambers passed their own proposals, sliced another estimated $200 million from spending, and canceled a $95 million deposit to the so-called Rainy Day Fund. Panagiotakos said higher education was slated to receive between $30 million and $40 million less next fiscal year than the current one. He said "thousands" of jobs could be lost if the added federal aid does not arrive. "Plan design," a proposal backed by local officials but opposed by unions because it would pare collective bargaining rights in health care negotiations, was held in conference. Murphy said the issue was not dead, but delayed. The lawmakers said they were pessimistic the federal medical assistance percentage (FMAP) funds would arrive. If it arrives in full, the bottom line would swell to $27.935 billion. "We are under, I would suggest, no illusion that this FMAP money is coming," Murphy said. "I think we're going to get some. I just think it's not going to be the full amount," Panagiotakos said. Hewing toward the Senate's elimination of Bunker Hill Day and Evacuation Day as Suffolk County holidays, the compromise preserves their holiday status in statute, but instructs government agencies to remain open and fully staffed, ending the Revolutionary War commemorations' priorities as public employee vacation days. "They remain holidays but the offices remain open," said Murphy. Many offices currently remain open on the holiday, with skeleton crews on hand and workers who do work on the holiday eligible to take another day off. Cuts include $56 million from a health care program for "aliens with special status." That program is eliminated in the budget. MassHealth, an account that often need large midyear infusions, took another $43.5 million in reductions, which leads to a $68 million gross reduction due to a takedown in federal matching funds. Murphy said lawmakers were optimistic the federal government would deliver roughly $160 million in Social Security reimbursements. He said the funding does not require congressional authorization. "We don't have a date certain, but we are optimistic we are going to get it this fiscal year," he said. The deal eliminates the lifetime appointment for the state's probation commissioner, allows 5 percent line item transferability for the state's chief justice of administration and management, and calls for a study of probation practices. Boston Public Library branches would have to remain open under the compromise. The budget will likely receive votes in both branches Thursday, reaching Gov. Deval Patrick's desk a week before the start of the new fiscal year. Patrick has 10 days to sign, veto or amend the budget. Panagiotakos and Murphy, budget chairs for their respective chambers, filed the compromise in shirtsleeves at 7:56 p.m. Wednesday night, four minutes before a deadline that could have choked off chances of a debate tomorrow. Panagiotakos, in his last budget cycle before retiring from the Legislature at the end of this year, sported a cigar in his breast pocket. In a statement released this week they note, "Since 2000, municipal health insurance costs have increased at double-digit rates — more than five times the rate of inflation — growing from just 6 percent of municipal budgets in 2001 to a projected 20 percent by 2020." The coalition, which includes the Massachusetts Taxpayers Foundation, is urging legislators to allow municipal officials to modify health plans without negotiating with each and every union. Employees' share of health insurance premiums would still be subject to collective bargaining. The move is favored by Republican gubernatorial candidate Charlie Baker. Unfortunately, Gov. Patrick and members of the Democratic leadership in the House and Senate remain fearful of the unions and would prefer to do nothing or modify plan design so as to render it meaningless. By giving mayors, town managers and selectmen full authority over the design of municipal health insurance plans and passing another bill requiring all retirees to make Medicare their primary source of health coverage, the coalition notes, cities and towns would collectively save an estimated $100 million in the first year alone, and reduce their annual expenditures by $2 billion by 2020. That is how Massachusetts Taxpayers Foundation President Michael Widmer describes the reform known as plan design, which would give local officials the same authority that the state has to control the design of employee health plans, outside of collective bargaining. Naturally public employee unions rage about the dire consequences of plan design, both financial and medical, when what they really care about is losing leverage. We’d note that the system works just fine for every unionized state worker. And now the time for compromise is over. It is time for true fiscal leadership. Fine, so it’s an election year and nervous incumbents are worried about offending the politically powerful. But next year’s budget was going to bring another round of local aid cuts even before fears of losing that $700 million in federal Medicaid assistance. Plan design and other municipal health reforms (including a requirement that eligible municipal retirees enroll in Medicare), which Widmer and a slew of business groups are pushing, are projected to save local taxpayers up to $100 million. METHUEN — Teachers union President Donna Gogas is calling for increasing property taxes and implementing "school user fees" to fund teachers' raises, according to an e-mail received by fellow teachers. The e-mail, transmitted Tuesday morning and spread around town, was read by City Councilor Jim Hajjar during last night's City Council meeting. "The responsibility of the city's services and other expenses belong with the city's taxpayers, not the employees," according to the text of the e-mail. "Admittedly, there is a financial crisis in that communities do not have the resources that we once had in past years. However, we feel that not all avenues have been taken, such as a full tax levy and the institution of school user fees," according to the e-mail read by Hajjar. Gogas has not publicly spoken about the e-mail since it was sent Tuesday, and an attempt by The Eagle-Tribune to reach her for comment last night was unsuccessful. Superintendent Jeanne Whitten has repeatedly called on teachers union leaders to make pay concessions to prevent more than 20 teacher layoffs as the schools work to close a $1.8 million budget deficit. City Councilors and School Committee members ripped Gogas about the e-mail. "She is advocating for paying teachers' salaries by raising taxes and implementing user fees. This is something that is abhorrent to the people in the town," said School Committee member Robert Vogler. "She's not even a taxpayer of Methuen. She lives in Haverhill," said School Committee member Evan Chaisson. "Shame on the person who wrote that letter," said Councilor Joyce Campagnone. "And I'm sure she is not a Methuen resident and (she's) collecting big bucks and taking it elsewhere." User fees typically mean students pay for things such as sports and bus rides. Methuen does not charge user fees. Hajjar said he was offended that Gogas expects that if the city raised taxes, "it's her money or the teachers' money." "I'm sorry, we're all in this together," Hajjar said. "It's not her money. It's the people's money." The School Department is using $500,000 from next year's budget for the renovation and addition to Methuen High School. Gogas said "asking employees to give up thousands of dollars of their salaries as donations for a new high school or to balance the school budget is not appropriate." The School Committee approved a three-year contract with the teachers union in October 2008, giving teachers 3 percent raises each year. For many teachers, the raises are combined with yearly step increases that will result in dozens of teachers receiving percentage increases in the double digits. School Business Administrator Glenn Fratto said "most, if not all" layoffs can be prevented if teachers cap their raises at 5 percent. Unions worry about teachers who are preparing to retire, and they fear that concessions will reduce the amount those people can collect in their pensions. But capping raises at 5 percent wouldn't impact older teachers because the teachers who are receiving the big raises are at the bottom of the pay scale and earning master's degrees, according to Fratto. Capping raises wouldn't even effect Gogas, who is slated to see her pay rise from $78,861 to $82,227, or by 4.3 percent, according to School Department documents. The School Department sent out 12 more layoff notices Tuesday, bringing the total number of pink slips to 39, Whitten said. However, the actual number of layoffs will end up being in the 20s. The superintendent said she needed to send out extra layoff notices because some teachers who are initially being laid off will be recalled if they do a job that nobody else is qualified to do, such as teaching children with intensive special needs. And every time a teacher is recalled, another teacher has to be laid off, according to Whitten. Carla Howell — chairwoman of the Alliance to Roll Back Taxes, based in Wayland — said her group submitted about 19,000 signatures to town and city clerks by yesterday’s deadline, a comfortable margin over the required 11,099 signatures. Her group put similar measures on the ballot in 2002 and 2008, but neither passed. She called the latest campaign a “modest start to bringing the state government in line with the level of spending that’s appropriate.’’ The proposal, Howell said, would force state officials to cut spending by more than $2 billion. But critics said passage of the proposed tax cuts would mean a financial crisis, as the state struggles to recover from the recession and overcome a $2.5 billion budget shortfall. Last year, lawmakers increased the sales tax from 5 percent to 6.25 percent, which they said generated more than $600 million as the state sought to balance its budget while cutting a raft of programs and benefits. The additional taxes cost residents an estimated $140 per person or $370 per household, according to Widmer’s group. But Widmer pointed out that the state continues to collect less in sales tax than do most of the 45 states that have a sales tax. Only three other states that collect sales taxes have lower tax burdens, because Massachusetts has a narrow sales tax base that excludes groceries, services, and clothing up to $175, he said. In testimony this spring before the Legislature’s Joint Committee on Revenue, Jay Gonzalez, secretary of the Executive Office for Administration and Finance, estimated that cutting the sales tax to 3 percent would cost the state $958 million in fiscal 2011 and about $2.5 billion in fiscal 2012. He said that cutting state spending on education, from preschool to state universities, would amount to only $1.5 billion. The state spends a similar amount on public safety, which includes the State Police and the Department of Correction. Officials from the staffs of state Treasurer Timothy P. Cahill, who is running for governor as an independent, and Republican gubernatorial hopeful Charles D. Baker said they want to see the sales tax rolled back to 5 percent. But they said they would implement the cut to 3 percent, if voters support the measure. Rick Gorka, a spokesman for the Baker campaign, said his candidate also supports another proposed ballot question that would repeal last year’s application of the sales tax to alcohol sales. The administration estimates that the tax will generate $93 million in state revenue this fiscal year and $110 million in fiscal 2011. “The voters have a choice, and Charlie will respect the will of the voters,’’ Gorka said. City and town clerks have until July 2 to certify the signatures for the proposed ballot questions. Howell’s group has until July 7 to submit the signatures to the Elections Division of the secretary of the Commonwealth. Howell nearly succeeded in repealing the state income tax in 2002, receiving 45 percent of the vote. In 2008, when opponents outspent her more than 10 to 1, she lost by a much wider margin, 70 percent to 30 percent. Howell said she hopes this year’s effort to cut the sales tax pressures state officials to reduce pensions and benefits of state workers and cut subsidies to private businesses. But Barry Bluestone, an economist who serves as dean of the School of Public Policy at Northeastern University, said there is little left to cut in the state budget. Geoffrey Beckwith, executive director of the Massachusetts Municipal Association, said the state’s towns and cities would suffer, too. “This would be devastating to the economy and threaten basic services,’’ he said.